You found out recently that you can never eat gluten again. After getting over the shock, mourning it a bit, starting to feel better, and realizing just how many foods are naturally gluten-free, you might be feeling pretty good. But there’s this nagging feeling at the back of your head. (Sometimes it’s screaming at the front.) Am I supposed to go my entire life without eating a cookie? Or a slice of bread again? Don’t be silly. Of course you can eat cookies. And pies. And cake. And scones. And even bread. You don’t need gluten to make these treats. Sure, there are now plenty of packaged gluten-free cookies on the market now. And they’re good in a pinch. But there’s nothing like homemade cookies, warm from the oven. Besides, if you’re a baker, you don’t just love the warm cookies. You love the entire process of baking. You love touching the butter to make sure it’s soft enough to cream with the sugar. You take a whiff of the vanilla extract again before adding it to the dough. You tap the flours into the bowl of the stand mixer slowly, to make sure they disappear into the batter. You know that the flavor of the cookie dough is better if it has been hanging out in the refrigerator for awhile. And when you are baking the cookies, you bend down and peer in the oven, giddy with anticipation. Most of all, you love passing out the warm cookies to people you love and watching the joy on their faces when they have tasted what you made. Here’s the great news. You don’t need gluten to have any of this in your life. You just need to do a few things. First? We would of course suggest that you start with our gluten-free flour, an all-purpose flour blend formulated for home bakers to make cookies, cakes, muffins, scones, and other familiar baked goods. We developed this flour over the past decade, with many trials and recipe tests. It works. It works well. We want to make this easy for you. So let’s start with that flour. You’ve probably been baking one way your entire life: by scooping out a cup of flour from the 5-pound bag of all-purpose bleached. It was simple to bake this way. Even mindless. However, that bag of flour is now like a bag full of anthrax for you. Don’t go near it. When people begin to bake gluten-free, they expect that the process will be exactly the same, but with different flours. Guess what? As is true of everything in life, those expectations are going to hurt you. Gluten-free bread dough, in order to bake up well, will have the thickness of pancake batter. The first time you make gluten-free bread, you’re going to look at that and think, “Well, that’s not right.” You’ll add more flour. And then you’ll end up with a loaf of bread so dense and hard that you could hit an intruder in the head with it when he or she tries to sneak in your door. Throw out your expectations of what bread should be. Start over again. As soon as you can clean the gluten out of your kitchen, sweep away the notion that anything will be like it was. And why would you want it to be, when the old way made you sick? You usually have to combine flours. Here’s where people also get stuck. Because AP gluten flour works for a multitude of baked goods  and it’s the only flour most people in this culture know  it’s easy to long for that one magic flour when baking gluten-free. However, for the most part, you have to combine 2 or 3 flours together to make a flour mix that will work for gluten-free baking. Want to know how and why? Watch this video on how to make your own gluten-free all-purpose flour mix. We tried to make it easy for you there. We tried to make it even easier for you by starting a flour company so you can buy that gluten-free flour from us instead. And if you want your baked goods to be more whole-grain than white, check out this post on how to make your own whole-grain flour blend. After you have shaken your flours in a big container, and the flours settle into one flour that is one color, what do you have? Flour. Use that flour for baking cookies, muffins, quick breads, pancakes, waffles, and biscuits. You’re done. If you need a guide to the gluten-free flours most easily available on the market, check out this guide we wrote for you. Learn to bake by weight. Americans are VERY tied to their cups. We believe that all baking has to happen in 1/2 cup measurements. Ounces? Grams? That seems like math. Believe me, if you want to become a confident gluten-free baker, able to make adaptations to all your favorite recipes, substituting one flour for another when you’ve run out of your favorites? This piece will tell you why. Sometimes people write to us — let’s be honest here and say it’s almost every single day — and ask us to convert our recipes into cups and send the recipes back to them “the right way.” Our answer? Nope. Buy a scale. You’ll thanks us later. You’re going to make mistakes. This is a funny business. But think about it  were you good at the violin the first time you picked it up? Or basketball? Or sewing? Why do you expect yourself to be good at this right away? Is it because you’ve always been a good baker with gluten flour? That might actually make it harder for you at first. As I wrote above, let go of your expectations. Go back to beginner’s mind. Feel the flours between your fingers and decide which ones you like. Learn the new textures of gluten-free batters and doughs. Expect to pull some really ugly-looking cookies out of the oven. They’ll still taste good. Your kids won’t care. Eventually, it will feel like rote, and you’ll wonder why you ever worried. But this space? This place of jarring differences and new experiences? This is where we learn. What’s the worst that could happen? A few bad baked goods? Eh, there are worse fates. Mostly, play. Allow mistakes. There are no failures. Learn from the mistakes. Laugh. A lot. Persevere. Psst! Here’s a secret. Most baked goods are actually better without gluten. You read that right. Better without gluten. You know why? Because that lovely recipe writer was trying to protect you from activating the gluten. Gluten in a cake can make your birthday celebration treat tough. But without any gluten? You don’t have to worry. Let that stand mixer spin. You’re not going to hurt anything. Gluten-free cakes can be far fluffier and more wonderful than the gluten ones. Think about it. Aren’t those of most of the baked goods you’re making at home? You don’t need xanthan gum to bake gluten-free. You’ll notice that most commercial baked goods, many recipes online, and some of the recipes we created the first few years of this site call for xanthan gum, guar gum, or a combination of the two. If you’re confused by this stuff, and the price, here’s the good news: you don’t need it. I found this out the hard way, through intestinal pain, cramping, uncomfortable bathroom experiences, bloating, gas. Okay, thats enough. You get the idea. Mostly, I was confused. I wasn’t eating any gluten. I cut out dairy, then corn, then anything that could be an allergen. Still there. I went for a colonoscopy and they found nothing, other than unexplained spasming. Frustrated, I stopped baking or eating any baked goods. Within a week, I felt entirely better. What the heck? It was the xanthan gum. Life has proved this to me many times since then. Xanthan gum - and to a lesser extent guar gum  does me no good. Now here’s the deal. Not everyone reacts this way to xanthan. You might be fine with it. If so, yippee! But it’s really not necessary anyway. 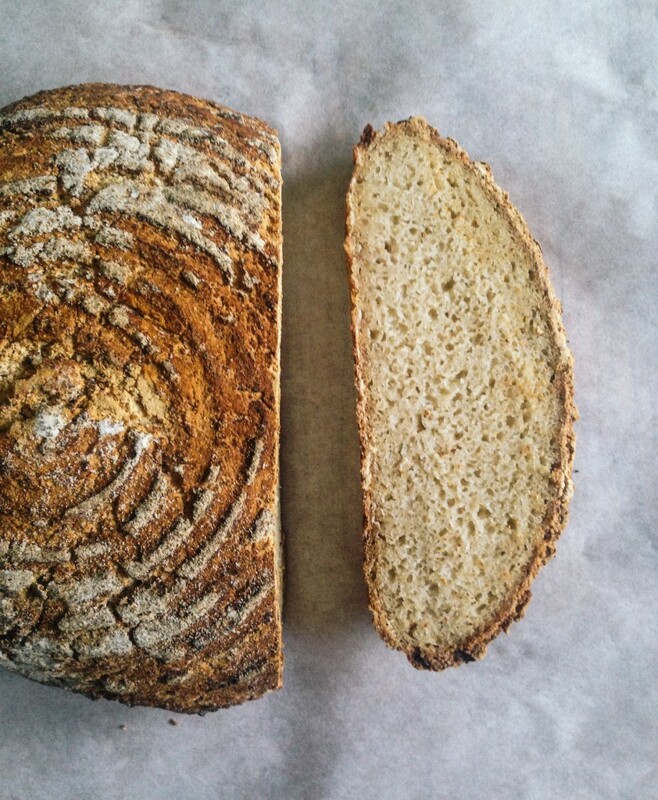 We love using psyllium husks in our baked goods. (Here’s a video that shows you how and why.) The baked goods turn out better now than they ever did with xanthan and the pinch of psyllium we use makes me more…regular. We also like ground chia seeds and flaxseeds in place of xanthan gum. In fact, sometimes we grind up chia seeds and flaxseeds, combine them with psyllium husks in a jar, and pinch in a bit of this combination when we bake. You’ll find your own way too. Oh, and if you want to make some of our older recipes, before we edit them all to be in grams and without the gums, simply replace any xanthan or guar gum you see with an equal measurement of psyllium, ground chia, or ground flaxseed. How do I convert my grandmother’s apple tart recipe so I can eat it gluten-free? Well, this is the easy part. Ready? Look at your grandmother’s recipe. Whenever it calls for 1 cup of gluten flour (or just, flour) substitute 140 grams of your favorite gluten-free all-purpose flour blend. Write that on a post-it note and stick it on the door of your baking cupboard. Done. Is it that easy? Mostly, yes. Sometimes, you’ll have to play a bit more. Maybe that cookie needs an extra egg white for more protein, or a little less sugar. Maybe you’ll decide to use dairy-free milk or coconut oil instead of the butter to make those cookies for a gluten-free, dairy-free friend. You can play. Any baked good that truly requires gluten  bread, pizza dough, rolls, etc.  will need some psyllium husks or chia or flaxseeds for stick-to-itiveness. Other than that, you’re good. Whew. That’s a lot of information. Can I start baking now? You don’t want to go the rest of your life without making chocolate chip cookies. And yes, now you can start baking. Here are some recipes from this site you might enjoy baking.